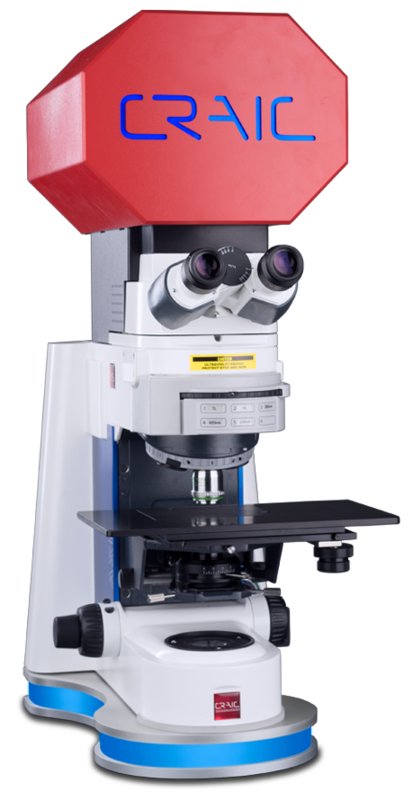 The 508 PV microspectrophotometer is a modular head unit that can be combined with your existing microscope to add microspectroscopy capabilities! The FLEX microspectrophotometer is an integrated tool to measure the UV-VIS-NIR spectra of microscopic samples easily and cost effectively. The 20/30 PV microspectrophotometer is a powerful modular system, featuring measurements from the Deep UV to shortwave IR. All CRAIC microspectrophotometers feature a unique seven position aperture system that provides reproducible and variable calibrated sampling areas with direct imaging of your region of interest simultaneously with your spectral measurement. This direct imaging of the sampling area is unavailable from any other manufacturer on the market and significantly increases the ease of use and confidence in your measurements. These microspectrophotometers are also compatible with other spectroscopy and microscopy modules from CRAIC Technologies -- including Raman microspectroscopy and UV or SWIR Absorption imaging. At CRAIC, our mission is to be the leading provider of superior quality optical analysis tools with world-class support for the customers using these tools.